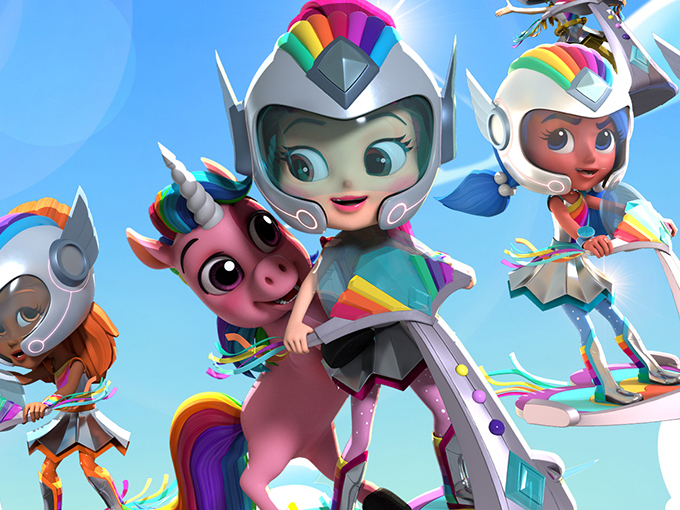 Nick Jr. USA, Nickelodeon's top-performing preschool network, will start to premiere and show Rainbow Rangers, Genius Brands' brand-new CG-animated preschool series that blends fantasy and action-adventure with accessible, mission-based stories about friendship and saving the environment, on Monday 5th November 2018 at 3:00pm ET/PT! The premiere marks the world debut of the colorful all-new series! Viewers will join them on exciting adventures, but also see them at home having the same daily dramas and hilarities as every preschooler watching the show. And at its heart, Rainbow Rangers is about empowering and encouraging girls and boys to take action and make a difference in their own homes and neighborhoods to improve and safeguard the planet. The Rangers, each with unique personalities and powers, will teach your preschooler all about inclusivity, trial and error, and environmental responsibility. Every viewer—boys and girls alike—will see themselves in at least one of these strong, unique and empowered Rangers! Rosie Redd: Rosie Redd is the leader of the Rainbow Rangers. With her strength power, she have lift, move and carry anything just about anything! Rosie possesses Strength Power. Lavendar LaViolette: Lavendar LaViolette loves music and dancing, and uses her Micro Power just by touching the flitter flower in her hair! Lavendar possesses Micro Power. Bonnie Blueberry: B.B. Blueberry loves science and maths. This Ranger's Construct-O-Max builds anything that the Rangers need to save the Earth! Bonnie possesses Vision Power. Anna Banana: Anna Banana loves all animals! She can even talk to them, and with her trusty Stuffy Wuffie, they can keep them safe! Anna possesses Animal Power. Mandy Orange: Love, peace and happiness are Mandy Orange's motto, and her Hypno-flute makes everyone happy! Tra-la-la! Mandarin possesses Music Power. Pepper Mintz: You can always find Pepper Mintz with her nose in her books. Pepper's Shimmer Shawl helps make everything invisible! Pepper possesses Inviso Power. Indigo Allfruit: Indigo Allfruit is the prankster of the Rainbow Rangers. She has super speed and can out run anyone and anything! Indigo possesses Speed Power. Floof: Rounding on the gang is Floof, the Rainbow Rangers' trusty Pink Unicorn! Floof can always make the Rangers laugh. He even loves to make an entrance! Viewers can visit nickjr.com, the Nick Jr. app and the official Rainbow Rangers show website, rainbowrangers.com to find out more about the show and its colorful superheroes and to watch exclusive video clips. Viewers can also follow the official Rainbow Rangers community on Facebook and Instagram for magical updates. Boasting a unique and highly-accomplished team of creators from the animated motion picture world, Rainbow Rangers’ creative development and production team includes Rob Minkoff (Disney’s The Lion King director), Shane Morris (Disney’s Frozen co-writer), Tim Mansfield and New York Times Bestselling author and Emmy-nominated writer Elise Allen (Dinosaur Train, Lion Guard, Barbie specials) who is serving as head writer and co-creator. Genius Brands’ Chairman and CEO and multiple Emmy-winning producer of more than 5,000 episodes of children's programming Andy Heyward serves as executive producer, with legendary Disney alum Ruben Aquino creating key designs. Aquino is responsible for the design and animation of many of Disney’s most iconic characters from award-winning films including The Lion King, Beauty and the Beast, The Little Mermaid, Mulan and Frozen. 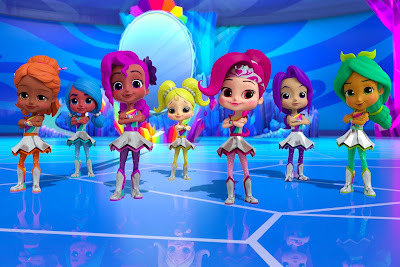 Nickelodeon will launch Rainbow Rangers with 'premiere months', airing five new episodes a month, every month, beginning in November and running through March 2019, with 'Premiere Promotion' accompanying throughout. To celebrate the launch of Rainbow Rangers, NASDAQ has invited Genius Brands International to do a Rainbow Rangers launch event concurrent with the Nickelodeon broadcast debut of the series live from New York's Times Square on November 5. The event will be live-streamed, and will generate publicity for the all-new brand. The event will have key licensees present and GNUS has special surprise guest! To support the series, Genius Brands has assembled over 20 blue-chip industry-leading licensing partners for the property's retail launch, including KIDdesigns (youth electronics), Basic fun (novelty toys), Mattel Inc. (master toy), MacMillan Publishing (master publishing), Bentex (master apparel), A.M.E. (sleepwear), Berkshire Fashions for cold weather accessories, BioWorld (bags, backpacks), Ceaco (puzzles), Disguise (Halloween costumes), Handcraft Manufacturing (packaged underwear), H.E.R. Accessories (jewelry and hair accessories), Jay Franco (bedding and bath), Dynacraft (bicycles), Kid Galaxy (bubble toys), Kiddieland (foot-to-floor ride-ons), and Planet Sox (hosiery) as well as Spirit Halloween for a direct-to-retail program. The retail program for Rainbow Rangers will begin rolling out in Back-to-School (July/August) 2019 with over 300 product SKU’s coming to the marketplace, allowing fans to bring the magic home! A second season of Rainbow Rangers is currently in pre-production. Nickelodeon holds the exclusive broadcast rights for the U.S. and Caribbean Basin. Genius Brands recently raised US$4.5 million in a funding round led by 32 Ventures to support the premiere and pre-production of the show’s second season. Earlier this year, the California-based company also appointed APC Kids as its exclusive distribution partner in EMEA. Originally published: Monday, October 22, 2018.